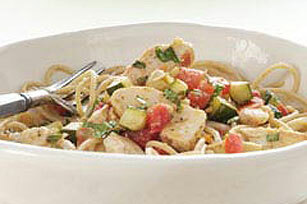 With chopped plum tomatoes, zucchini and artichoke hearts, this Italian Chicken Primavera is truly a vegetable lover's dream come true. Cook and stir tomatoes, zucchini, artichokes and garlic in large nonstick skillet on medium-high heat 5 min. or until zucchini is crisp-tender. Add chicken and basil; stir. Cook 5 min. or until heated through, stirring occasionally. Serve over the hot spaghetti; sprinkle with cheese. Cover and refrigerate any leftovers. Serve as a cold pasta salad. This great-tasting recipe can easily be prepared with dried basil if you don't have fresh. Just use 1/2 tsp. dried basil instead.